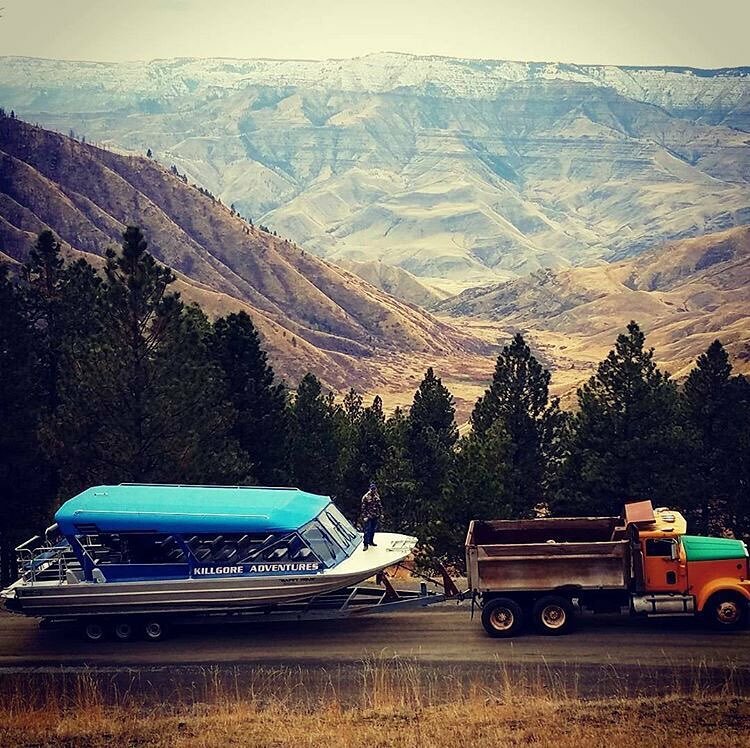 Our customers always ask us how we tow the boats into Hells Canyon at the beginning of the season. You are looking at it right here! 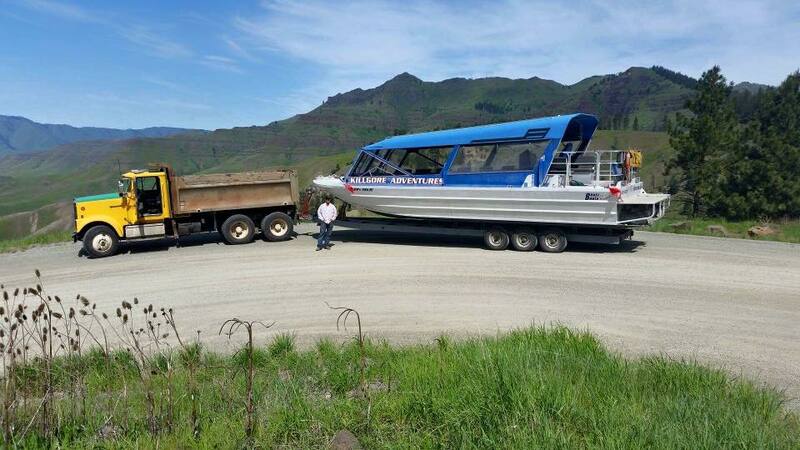 We always explain that, yes, we tow them in with our dump truck and leave the big boats in the river for the whole season. Here is a picture of Kurt doing just that! 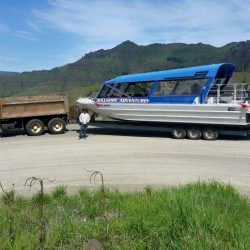 He spent the morning carefully driving this big dump truck over the dirt road to Pittsburg Landing and getting the boat prepared and ready for our upcoming busy season. Once we bring the big boat in, it stays at Pittsburg Landing for the entire summer. The first year we did this was 2005. 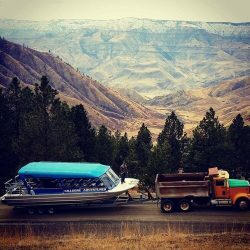 This boat is a 36-foot triple Bentz boat with THREE diesel engines (945 horsepower combined). 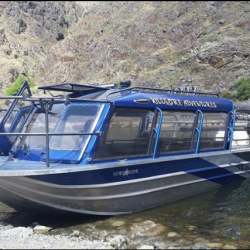 The boat is named “Happy Hour” and is specially designed so we can roll the top back and get all the passengers wet on the hot days, with seats for everyone. 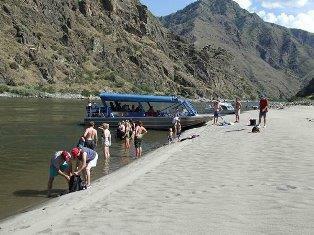 You can stay dry if you would like to and hang out in the shade on the boat. 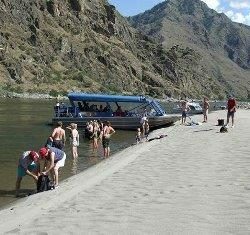 Happy Hour is a 36 foot Bentz boat and has been the backbone of our business since 2005. 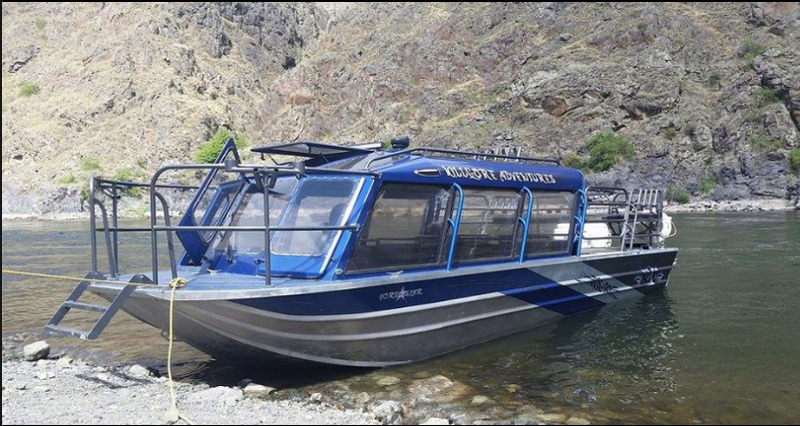 Here is a cool fact: even though this is a massive sized boat, it only needs 6 to 10 inches of water to travel depending on how heavy the load is. We hope you like these behind the scenes photos of us getting ready for our busy season! 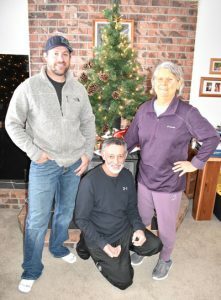 We sure like sharing moments like these with you guys, and hope you know how much we value and appreciate our loyal customers.